The Foundation for Polish Science (FNP) is announcing a call for expert candidates as part of the Smart Growth Operational Programme 2014-2020 under Measure 4.4 “Increasing the human potential in the R&D sector” as part of which it fulfils the role of the Implementing Authority. 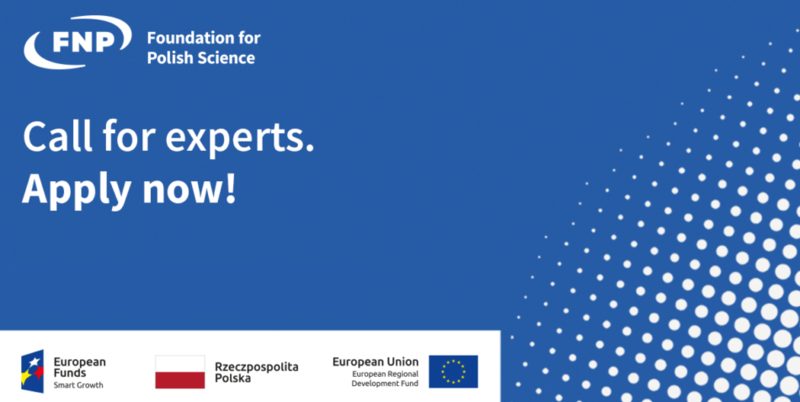 Specialists from scientific and business circles are invited to apply as expert candidates for supporting the substantive evaluation of projects proposed for co-financing under Measure 4.4 of the SG OP, implemented by the Foundation for Polish Science. In applying for the expert candidate status, you should indicate your area (or areas) of specialisation covered by the SG OP and have the necessary knowledge, competences, experience and authorisations. In view of the above, you may apply as an expert candidate in science, business, or in both domains. NOTE: Please log in as a user (applicant). Users who do not have an account yet, should first create it. Users who in the past acted as reviewers/panelists for the Foundation should not use their reviewers’/panelists’ logins, but instead log in as user/applicant (if you do not have such account, please create it first). After logging in please select “FNP expert database” from the list of “Available programmes”. 3. attach the Expert Candidate’s Statement to the electronic application. The call for expert candidates is continuously open. The tenth round began on 16 January and will continue until 22 January 2019. Detailed information on the rules of the call and cooperation with experts can be found in the downloads listed below. Should you have any further questions or doubts, please contact us by e-mail on: eksperci@fnp.org.pl.